~$5 - $20 USD for misc. Step 1 - READ THE INSTRUCTIONS! Also think about where you want to mount it. Step 2 - Locate which harness connect that you will use. 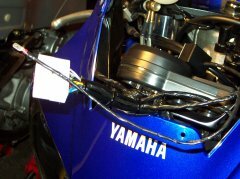 NOTE: The connector I used on the R6 was the main harness to headlight connector. 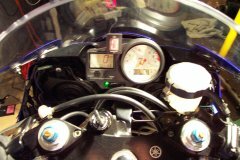 The link below shows how to do it from the back of the gauges. 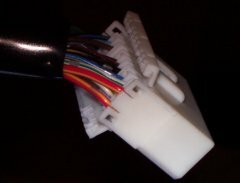 Step 3 - Access your connector. This may require removal of body panels, but I did not have to. Step 4 - Determine the wires you'll need to access (Read the instructions). 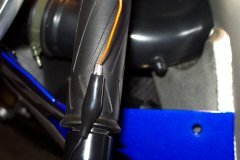 Many connectors such as the one to the right have snap guards to help prevent the wires coming loose from vibration, if the wire clip itself comes loose. Step 5 - Remove required wires. Each wire is attached to a pic connector. These have little clip like tabs that stick into a section of the larger main harness body. Simply look down into the harness, you should see the clips. Use your pick to gently push the pin down and pull the wire out (at the same time). Step 6 - Make connections. Protect the area! 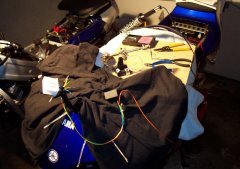 Just solder the Digi connectors to the appropriate wires you removed from the harness connector. 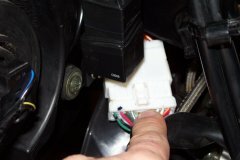 BE SURE to NOT impede on the little pins, otherwise when the harness is re-connected, they could push out if they are damaged. Use the male connector on the orange wire, and use the other female side as a cover for it. Step 7 - Clean up the wires. Use the zip ties and electrical tape. Don't forget the tape the orange Digi wire separate! Step 8 - Mount it. Mount to your liking using velcro, double sided tape, zip-ties, whatever. Step 9 - Program it. 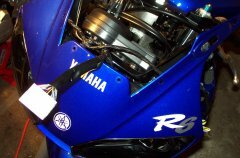 Follow the instructions for programming, here is where you'll need the rear or center stand. 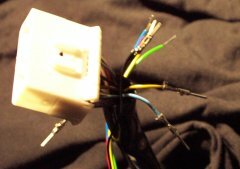 To make it easier, I used the battery ground and ran some wires with alligator clips to the orange Digi program wire. Don't forget to isolate (cover) that orange programing wire and tuck it away when you're done. Step 10 - Sit back and admire your work! The top picture is the view I have while riding and a close up under it. 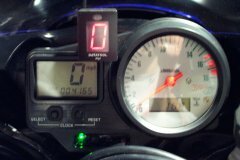 It should start recognizing the gears as soon as you let out the clutch, then showing the horizontal bar to show it's got that gear. 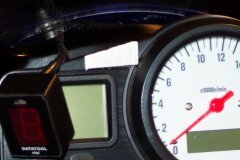 If you're having problems programming, re-read the directions, turn the bike off, and start the programing over.